1. 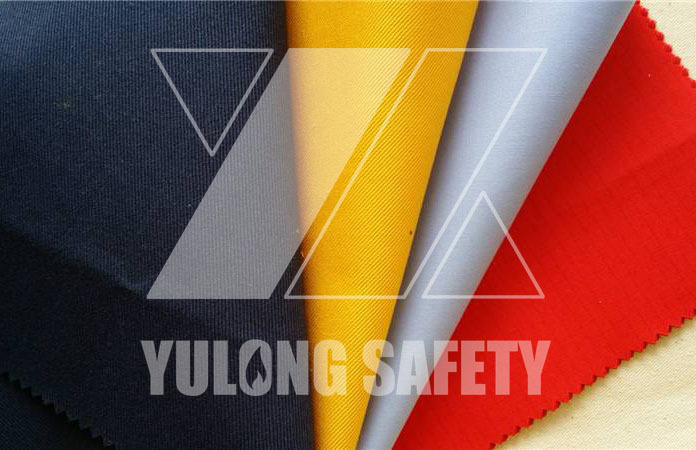 FR anti-static fabrics require the front anti-static lines of the fabric are not obvious,so the general twill and satin will use the reverse mosaic method, which is often ref erred to as the back-embedded type, so that the anti-static yarn in the fabric appears on the reverse side. , to achieve a positive look at the anti-static yarn is not obvious.one more thing need to be noticed , The antistatic yarn used in FR antistatic fabric is a little thinner than normal yarn , so the visual effect of the fabric will be good , if the antistatic yan thicker than normal warp , The front side will highlight the antistatic strip after the fabric pre-shrink process , which make the appearence of the fabric very bad , and this weave method will lead to better antistaic effect on the reverse side of the fabric than the front . 2.It needs to be processed by inlaid technology if the FR antistatic fabric want to have better antistatic effect , make the antistatic yarn woven in warp , which will make both sides antistaic effect more better and closely , The medium-dark colored FR anti-static fabric doesn’t see the antistatic yarn on the fabric surface too much, while the light-colored FR anti-static fabric will clearly see the anti-static yarn in the warp direction. If the fabric is made of organic conductive fiber, the antistatic effect of the fabric will be better than that of carbon black., so its needed to inform clients the antistaic fiber material at first . 3. IF clients want better antistatic effect of the FR antistatic fabric , it necessary to increase the content of the antistatic yarn ,first method is reduce the space of the antistatic grid ,the second, if the metal anti-static short-circuit is used, It is necessary to increase the proportion of anti-static yarn to increase the anti-static effect. All in all , we need to use the most resonable antistatic weaving method according to the actual requests of clients’to meet clients’ request for the FR antistatic fabric .